I don’t know if it’s just me, but sometimes (and sorry to all the vegetarians out there) I just get a craving for a steak. I love all sorts of food (sadly the reason why I’ll never be slim) but there’s just something about the delicious combo of steak and chips (and peppercorn sauce…) that makes me really happy. 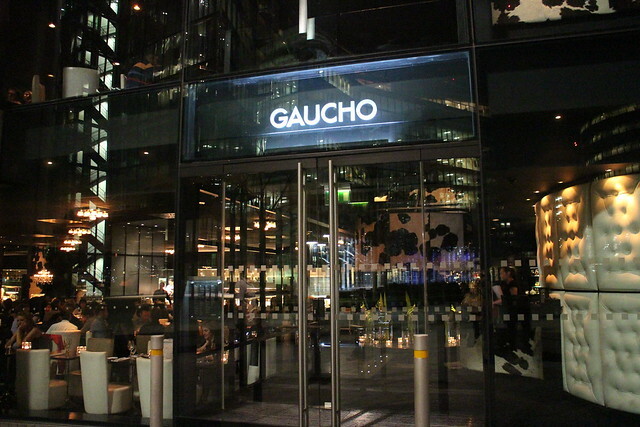 So a couple of week’s ago, we headed out to get our red-meat fix, for a belated Valentines/who needs an excuse dinner out to Gaucho Tower Bridge. The location is actually pretty convenient as it’s a stones throw from where Ollie works, and it doesn’t hurt that the view is pretty spectacular either – it’s one of those views that you just can’t help but look at and fall a bit more in love with London. The restaurant itself is just away from the river and has similar decor to the other locations in the chain (I have previously been to the Charlotte Street location and they’re very similar) all dark walls and cow print chairs. Very cool feeling and looking. But we weren’t there to admire the decor, we were there for food. I actually knew the food was going to be pretty delicious already, having eaten there before – but you never know, sometimes even a high-end chain has an element of gamble with it. 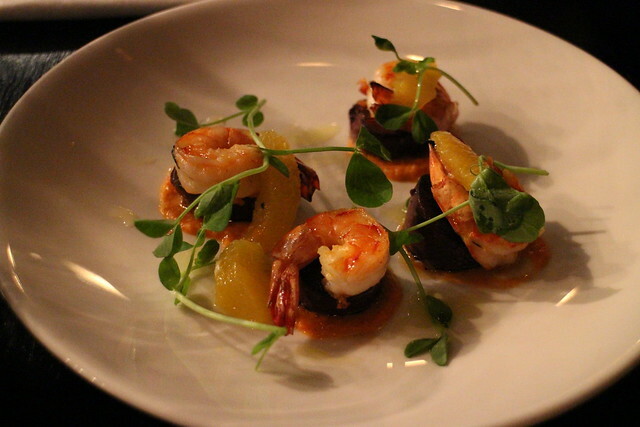 I skipped the starter, deciding to save some space for the meat-fest (and a possible desert after) but Ollie chose the prawns – they were gorgeously presented and very tasty (I tried a bit) the perfect starter size that leaves you wanting more and ready for your next course. 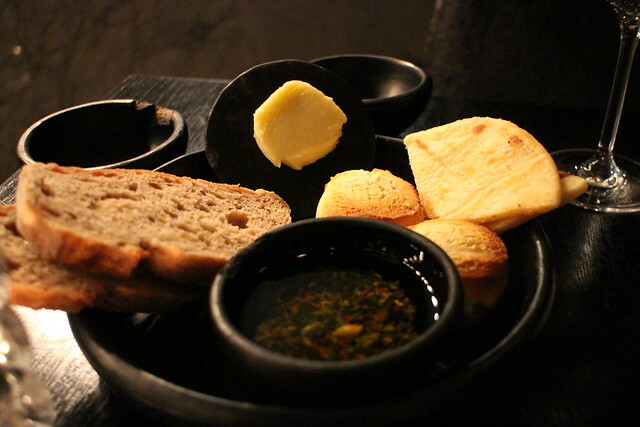 I did indulge in the bread basket though – the little cheese rolls were pretty special. For the mains, it did have to be the steak – the waitress brings a board stacked with different cuts to demonstrate to you what they’re each like ahead of your selection. I chose the medallions, which is two smaller sized fillet pieces – the perfect size and my favourite cut as it’s juicy without being lined with fat. I went for it medium rare and it was cooked to perfection. Ollie had the sprial cut option, a longer and thinner piece that’s marinated – he said it was tasty, but having asked for it rare it came medium – so he was a little disappointed on that front as he much prefers his on the ‘still moo-ing’ side of the cookery scale. 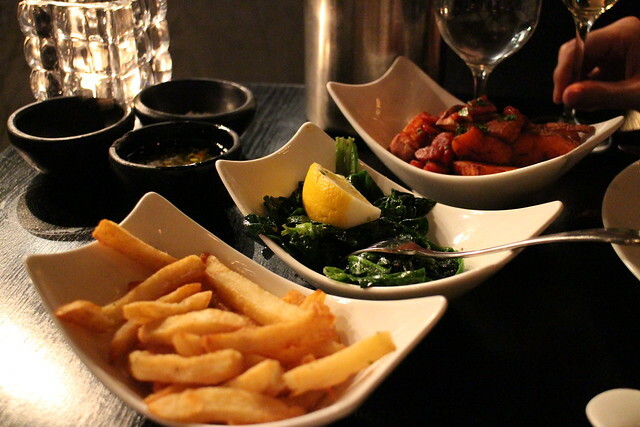 For sides, we shared three – spinach (token veg), chips (essentials) and sweet potato and chorizo…oh my goodness, this combination is such a winner. So delicious, and a definite must have if you go there. Then, being the little miss piggy that I am – I couldn’t resist the cheese offering for the pudding option. With a wide selection to pick and mix from, I chose a red-wine cheddar, a soft French cheese (I forget the name) and a Stilton. 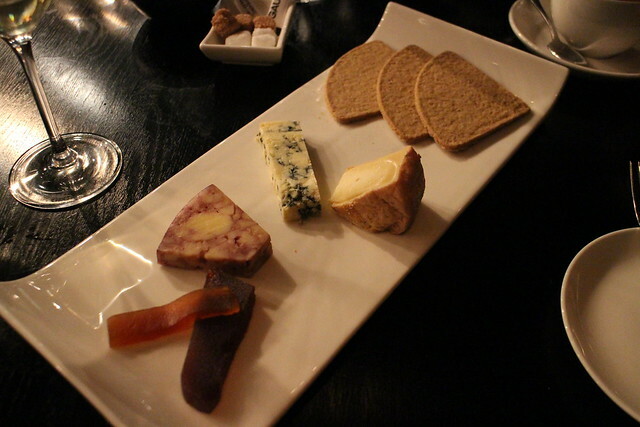 All delicious and my favourite way to end a meal – I much prefer a cheese plate over a slice of cake! 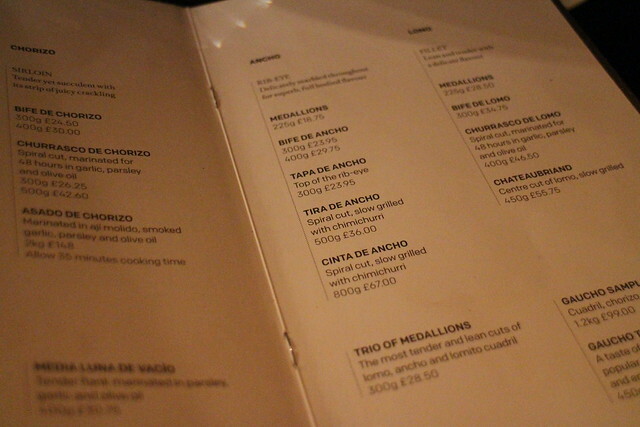 Overall, Gaucho is definitely one for a special trip as the prices aren’t too cheap. But you can be pretty confident you will have delicious food in a really lively atmosphere. In terms of location, the Tower Bridge one takes some beating – can already picture going back in the Summer and having a little walk along the river after the meal (have to walk off those medallions somehow!). 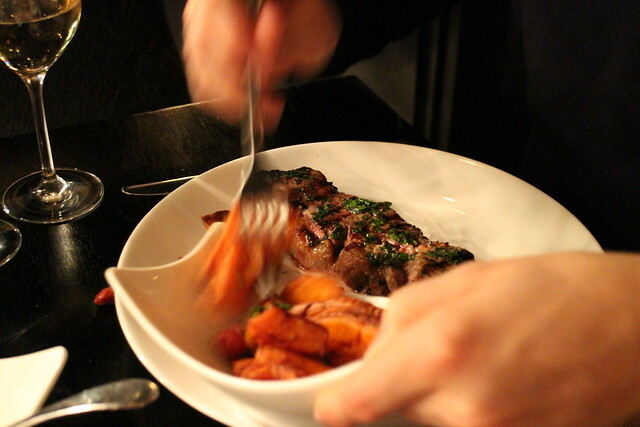 But if you’re partial to a juicy steak, Gaucho is a must-visit. I absolutely loveeeeeeeee gauchos, I’ve been to the one in the O2 as well as the one in Leeds, they just go the extra mile in every aspect! It’s like a birthday present to myself when I get to go. Definitely a special treat, such a great place! Being a vegetarian the food isn’t ideal for me but the view looks amazing. I love London at night time is stunning. It was lovely, will definitely go back! 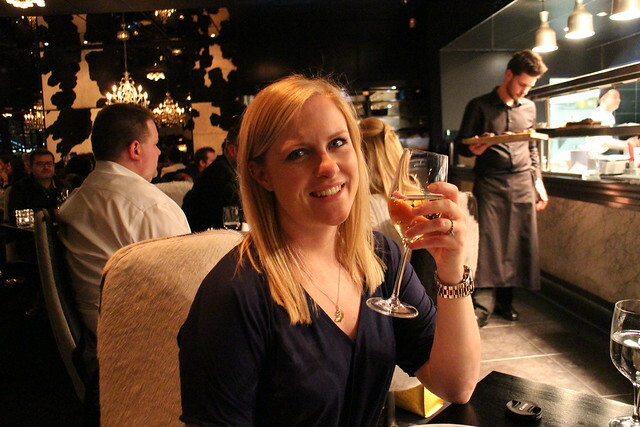 Gaucho is my favourite restaurant! When in London I always go to the Spring St one but I live in Dubai and Gaucho in Dubai is right next to my office-lethal!